SCITUATE – The 18-pound, barnacle-encrusted lobster had seen better days. After evading for at least 75 years the fate met by countless other crustaceans, he found himself in an offshore trawler, ultimately ending up in the tank at Mullaney’s Fish Market in Scituate. Luckily for the lobster, store owner Joby Norton has a soft spot for older sea creatures. Dubbed “Luke” by the staff at Mullaney’s, the humongous lobster will soon return to his natural habitat. Norton plans to send him back out to sea on a lobster boat as soon as this weekend. Luke has become a mascot of sorts during his three weeks in the market. Norton purchased him from a local lobster boat that caught him offshore. Lobsters typically shed their armor every year, making it hard for biologists to determine how old they are. Norton believes it’s been a few years since Luke shed his shell. 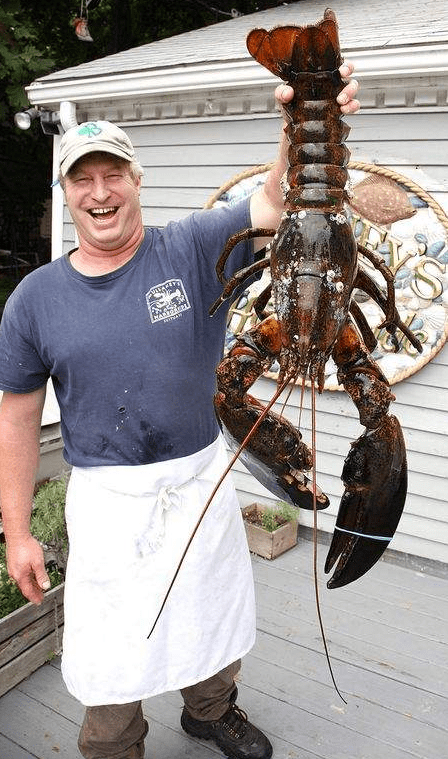 The Massachusetts Lobstermen’s Association claimed the record for the largest lobster in 1974 when it caught the 37.4-pound “Big George” off Cape Cod, according to the National Oceanic and Atmospheric Association. The average lobster weights about 1.5 pounds. Norton said customers have been “amazed” by Luke’s size, especially when he’s next to a 3-pound lobster, typically considered large. Norton said he’s seen lobsters as large as 24 pounds, but he hasn’t seen one as big as Luke in about a decade. He’d sell for at least $100, Norton said.